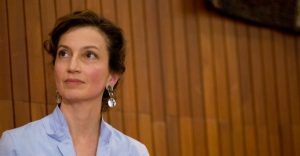 France’s candidate Audrey Azoulay was elected Friday the future Head of the UN agency for education, culture and science (UNESCO) beating her Qatari challenger, who was let down by Gulf countries opposed to Doha in the lingering diplomatic crisis shaking the region. Azoulay, aged 45, beat Hamad bin Abdulaziz Al-Kawari with 30 votes against 28 at the last round carried out on Friday. Azoulay received the support of Egypt after Cairo’s candidate Moushira Khattab was edged out in the first round. Egypt is the fourth Arab country besides Saudi Arabia, United Arab Emirates (UAE) and Bahrain which has severed ties with Qatar over its alleged support for terrorism. The four have cut ground, sea and air links with Doha. Vera El-Khoury, Lebanon candidate in the race hinted that the vote was dominated by power play instead of consideration for candidates’ programs. Kawari was front-runner until the Friday round. His lead in the vote irked several countries including Israel. Azoulay will be confirmed in her new position on November 10 during all the 195 member-states meeting. She will be the second woman to lead the UN agency after outgoing Bulgarian Irina Bokova who has been in the steering seat for 4 years. With Moroccan Jewish roots, Azoulay was French culture minister from February 2016 to May 2017. She also worked for the European commission as legal expert in the fields of culture and communication. She graduated from France’s school of public administration, l’Ecole nationale d’administration, and holds an MA in Business Administration from the University of Lancaster (UK) and a degree in political science from l’Institut d’Etudes Politiques (France). She will face the challenge of bringing back the US and Israel, which announced Thursday their withdrawals from the organization on anti-Israel bias ground. Written by: KanelkaTagba on October 14, 2017. Posted by KanelkaTagba on Oct 14 2017. Filed under Gulf News, Headlines, World News. You can follow any responses to this entry through the RSS 2.0. Both comments and pings are currently closed.